See a complete listing of productions planned for this academic year. Park's theater program is integrated into the curriculum through course offerings in the Middle School and Upper School. During coursework and co-curricular activities, students explore the nature of what it means to be human, developing the individual's sense of self as well as expanding his or her ability to empathize with others. Analyzing serious issues and creating thought provoking theater of import are central to the program, as is developing students' creative self-expression, self-discipline, and self-confidence. 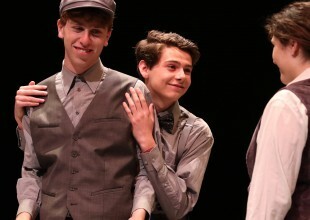 Upper School students, through a strong Stanislavski-based curriculum, develop fundamental skills that allow them to transform character psychology into truthful human behavior and that allow them to live truthfully within imaginary circumstances. Along with this traditional base in realistic acting, students may pursue in-depth study and performance of Shakespeare's plays through collaborative courses offered jointly by the Theater and English departments. Courses in directing may lead a student to direct a fully mounted production in the winter or spring. Students wishing to pursue design may take design courses and earn credit for designing scenery or lighting for mainstage and blackbox productions. 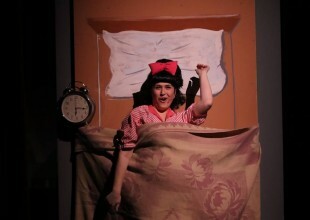 Onstage, the Upper School typically mounts three major productions and several one-acts throughout the year. Every fall the 300 seat Meyerhoff theater rocks with the sounds of the musical. From classics like our recent production of Gilbert & Sullivan’s The Pirates of Penzance to powerful new musicals such as Lin Manuel’s In The Heights, Park offers opportunities to performers of all levels. This large community event might feature middle schoolers alongside upper schoolers and almost always shows off student designers, musicians, and choreographers. The Winter Production every February features student directors directing short plays and has become one of the most popular shows of the year. Students who have taken the directing class direct plays of their own choosing, which often results in risky, hard-hitting, and often hilarious shows. Students who might not have the time to participate in one of the major productions can enjoy acting in a ten to thirty-minute play, produced in a festival format. Shakespeare has long been a tradition at Park, and every other year the theater department collaborates with the English department to study one of Shakespeare’s plays in a fall English class and then produce the play as the Spring Production. Recent productions include Much Ado About Nothing set in a Spanish Villa, a mixed race cast in Romeo & Juliet, and a dazzling production of As You Like It with a forest 400 years older than its counterpart contemporary court setting. Groundbreaking plays such has Lorraine Hansberry’s Raisin in the Sun and hot new plays such as Clybourne Park and Mr. Burns – a post-electric play complete our theater season on alternating years with Shakespeare. Park was one of if not the first high school in the country to produce Clybourne Park, Bruce Norris’ provocative play about race in America, and Park has secured the rights to be one of the first non-professional productions in the country of Anne Washburn’s brand new, powerful, funny, disturbing, and ultimately hopeful play about our near and distant future: Mr. Burns – a post-electric play. Only at Park are freshman and sophomores given their own production. No pesky juniors and seniors to compete with for roles. Every May the fresh/soph play allows 9th and 10th graders to research, analyze, rehearse, and perform a play that’s chosen just for them. Recent productions have included J.M. Barrie’s Peter Pan, Shakespeare’s A Midsummer Night’s Dream, Woody Allen’s Don’t Drink the Water, and Kaufman and Hart’s You Can’t Take It With You. Stage Combat, a coed “X” block activity, meets weekly on Fridays, where students can take out all their aggression while learning basic techniques for hand-to-hand combat, rapiers, and broadswords. 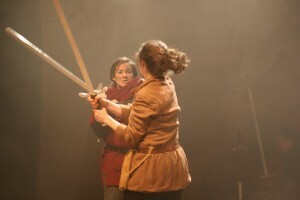 The year-long activity often culminates in a short performance of famous fights from popular movies such as The Princess Bride. The Stage Combat activity has also helped choreograph the fights in Park productions such as Romeo & Juliet and Henry IV, and two members of the club recently starred in The Pirates of Penzance. This class is dedicated to the construction of sets for the Upper School productions. In the first semester students are engaged in building scenery for the fall musical and then helping with the 8th grade production. In the spring they begin with the 8th grade production and then support the next three shows in the Macks-Fidler Theater. Working backstage involves reading plans, building and painting scenery, as well as hanging and focusing lighting fixtures based on a lighting plot. Students taking this class may work backstage during the show if they wish to do so. The primary goal of the Drama Program in Middle School is to help students understand themselves and the world they live in, and to develop self-expression, self-discipline, and self-confidence through an active physical, emotional, and intellectual identification with a fictitious situation. An equally important aim is for students to understand the theater as a serious intellectual pursuit that requires rigorous work and attention and is, at its core, communal in nature. The most developmentally appropriate form of a drama class for young adolescents is one that teaches through the aesthetic experience, not for it. To that end, all sixth and seventh grade classes are training, rather than performance, based. In the eighth grade, students may elect the production as a first-semester offering. A Park tradition, this is an integrated theatrical experience where students participate in all aspects of the production: lighting, sound, set design, costumes, makeup, and acting, culminating in a full-length play at the end of the term. 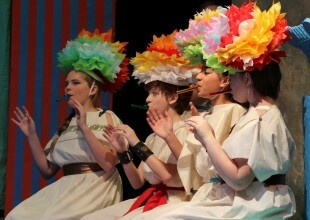 Eighth graders present a full-stage theatrical performance at the end of the semester. Students study all of the production elements that combine to make an integrated performance in a theater troupe. These elements include: light, sound, set design and construction, properties, costumes, makeup, text, and stylized movement. Significant opportunities for leadership exist both onstage and as part of the stage/design crew.